As spring gets warmer and baby chicks get older, people wonder when their chicks can get outside for some exercise and time to scratch and peck. After all, the ultimate goal for your chickens is to live in the backyard. But when is that possible? Are there small steps you can take toward the ultimate goal? Pictured are flashbacks and a video from the first time some of my baby chicks ventured outside. It was warm (over 80 degrees) and sunny with very little wind — definitely a good time for some first explorations. At just a few weeks old, the chicks couldn’t just be let out on their own. They needed protection, so I rigged up a safe place for them using an old raised garden bed frame that I securely covered with mesh. I placed their food and water inside the enclosure and I let them safely explore in this supervised and contained spot. They loved it and so did the big chickens. Our full-grown Silver Laced Wyandotte, Easter Egger, Barred Rock and Buff Orpington all stopped by to check out their future new friends. When you hand-raise baby chicks you act as a broody hen, essentially their mother, and you need to meet all their needs. One of these critical needs is heat. For their first week of life, baby chicks should be kept at 95 degrees. There are multiple ways to supply this heat. I prefer a heat plate because it’s safer and supplies heat much the way a broody hen would. If you use a heat lamp, remember the 95-degree temperature should be where the chicks are located. Keep a thermometer at the floor of the brooder so you know what temperature the chicks are experiencing. TIP: If the brooder is too hot, the babies will scatter from the heat source and pant. If the brooder is too cold, the babies will squawk loudly and huddle. Each week, the brooder temperature should be dropped by five degrees. At weeks four, five and six, the outdoor temperature may match the temperature of your brooder. 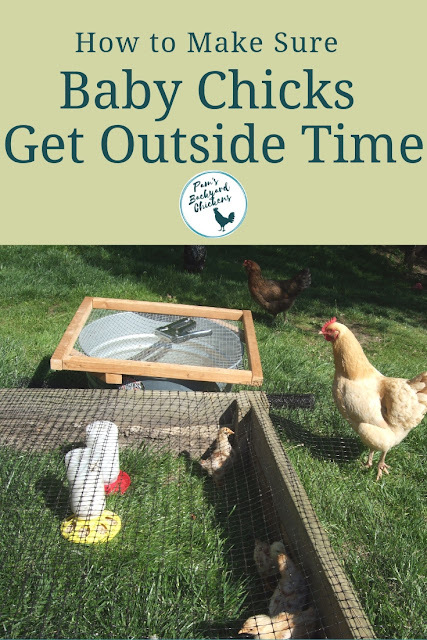 At this point, the baby chicks may enjoy some supervised outside time. Unlike the brooder, a trip outside exposes the baby chicks to the elements like sun, rain and wind. They are not used to all these elements and can quickly get stressed. Keep this in mind as you set up your protected outdoor space and be sure to add some places where the chicks can get out of the elements. It’s also a good idea to make the chick’s outside exposure gradual. Start off with a short visit, then increase the time. Remember that baby chicks don’t have a broody hen to defend them and they are bite-sized for so many predators. Even your friendly dog or cat may find the temptation irresistible. So, make sure their enclosure is predator-proof. Also, be sure to supervise the chicks while they’re visiting the outdoor world and take your cues from them. They’ll let you know if they’re uncomfortable and should be taken back to the brooder if that happens. The best time to live outside full-time is around nine to 10 weeks. Chicks should be fully feathered. Temperatures should be no lower than 50 degrees because young chickens don’t have a lot of body mass. Acclimate them before putting them outside for good. And be sure the coop is draft free.